A set of illustrated verb cards enabling students to learn and practise conjugating 100 verbs in the present, perfect, imperfect and future tenses. Support your students in learning, practising and testing themselves on 100 verbs in the present, perfect, imperfect and future tenses. Suitable for all levels, these cards offer immediate feedback, and are perfect for students to learn at their own pace or in pairs. 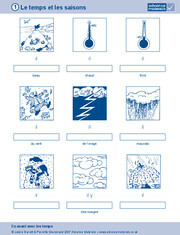 Colour coding, illustrations and the unique interactive design, help learners to remember the verbs and tenses in context as well as building up their vocabulary and allowing the learners to test themselves. Downloadable MP3 files, from our website, offer pronunciation practice as well. Encourages independent learning – immediate feedback is provided. Ideal for use as a regular revision tool. Useful classroom tool to occupy students who have finished work quickly. Excellent as a catch-up tool for students who have missed lessons. Excellent practice for moving from one tense to another. 16. A la station de ski (verbs which need être in the perfect tense).